Adanis "offered" $320 million royalties holiday for Australian coalmining project, as expert says it is "not viable"
Pointing out that “the royalty rate will then increase after several years”, quoting sources, ABC said, “Under the proposed agreement, the state would lose out on a total of $320 million in royalties”. 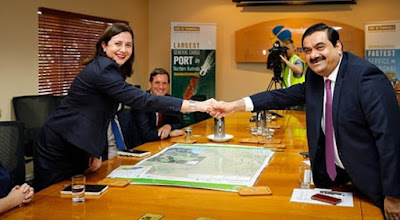 The offer has come following Queensland state premier Annastacia Palaszczuk’s negotiations with Adanis over the proposed royalties holiday. Following the negotiations, the report quotes Palaszczuk as saying, "What we know about this project is that it is vital for regional jobs." The Carmichael project is expected to produce 25 million tonnes of coal a year in its first phase. The Guardian quotes Prof Will Steffen’s Climate Council report to say that a “carbon budget” approach to a global warming limit of 2C rules out Carmichael coalmine. “As a catalyst for opening up neighbouring mines, it could lead to total emissions from Galilee basin coal matching ‘one of the top 15 emitting countries in the world’ and making up 130% of Australia’s total carbon pollution.”, the report adds. Steffen said his key observation from the report was that rising impacts at “modest temperature rises” – such as bleaching of the Great Barrier Reef – along with more extreme events and warming of 1.1C-1.2C already “really put the pressure on getting out of fossil fuels probably faster than most people have thought”. “The real question is how fast can we phase out our existing mines and existing power stations before their normal lifetime is up. How do we hasten the transition? So any talk of opening up a vast new area of coal is completely out of whack with what we know about what’s happening with the climate systems”, he added.